the traditional cookies i bake every year for eid are not traditionally traditional type cookies, if you know what i mean. it actually falls into the category of modern cookies or kueh. Traditional kueh raya (eid cookies/pastries) would be the kueh bangkit, kueh makmur, kueh tart-type, biskut kachang type cookies. These are cookie recipes which date pre-1960s Singapore and uses traditional ingredients, i.e. no cornflakes, chocolate chips which are modern ingredients that only became popular and widely used in baking after the 80s. 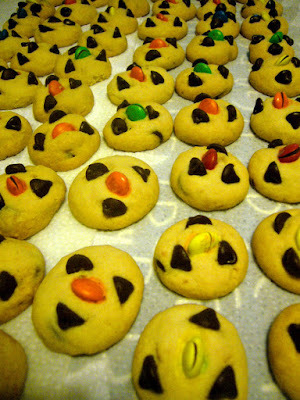 But these M&M cookies that feature in our eid fare every year, for more than 10 years now, are traditional to my family although they fall technically into the modern cookie category (m&ms and chocolate chips!). My sister always looks forward to these and eid would not feel complete without these cookies (don’t you just love the colours?). I love that traditions are being created every day. So what are we holding onto anymore? Tell you what, i think i’ll start a new tradition this year- something wacky like errrr…macarons for raya!